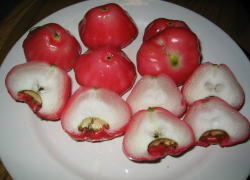 Jambu Air (Eugenia aquea), The Water Apple is known in Malaysia as jambu air or jambu air mawar. It's white or pink flesh is mildly fragrant with a faint sweetish flavour. 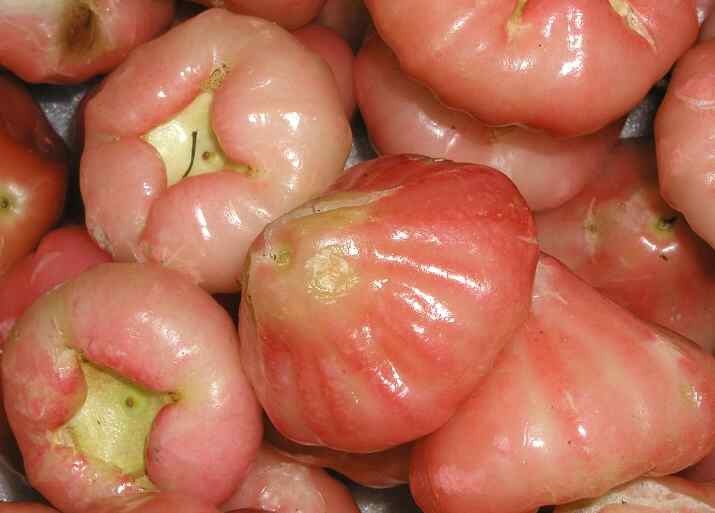 I first tasted one when traveling in Sri Lanka, in Sinhalese they called it Pini jambu or Karabu nati. I would very much like to find a source for these here in the US. Rose apple is a name applied to any group of fruits of this genus, but should only be known by the Indian/Malay name of "jambu". Jambu has a Sanskrit origin and is applied in Malaysia and Indonesia to several quite different fruits. In Malaysia, it generally means cultivated fruits as opposed to those in the wild; but it is most often used to refer to fruits from this particular genus. The same holds true in Indonesia, except that the word can refer to plants of other genera. For example, "jambu batu" (stone jambu) refers to the guava, while "jambu met" means the cashew fruit. Rose apples are indigenous to Southeast Asia or the Indian subcontinent. They do bear a superficial resemblance to apples, but are quite different to eat. -- Syzygium jambos is the true rose apple or Malabar plum, which is cultivated in the West Indies and in Asia, but native to the Malay peninsula. The fruit may reach the size of a small yellow apple and often tinged with pink or a greenish colour. It has a waxy surface and a faint aroma of a rose. The flesh is also rose-scented, whitish, crisp, and juicy, but rather tasteless. It is best mixed with other fruits. Other names include: gulab jamun (Hindi), chom-phu nam (Thai), jambu mawar (Malay), jambu + other adjectives (Indonesian), futomomo (Japanese), pommerac or rac apples (West Indies). Malabar plum is a name that often refers to another related fruit called Jambolan. -- S. malaccensis is the Malay rose apple, the fruit of a tall and striking tree which is cultivated from India to China and Hawaii, where it arrived before the Europeans. Native to the Malay archipelago, the fruits are roundish, but slightly oblong and narrowed at the stalk end and measuring between two and three inches. The skins are waxy and rosy when ripe with faint white markings. The flesh is scented, juicy and slightly sweet. Other names include: melaka jamrul (Bengali), chom-phu sa raek (Thai), jambu bol (Malay), darsana (Indonesian), ohia ai (Hawaii). 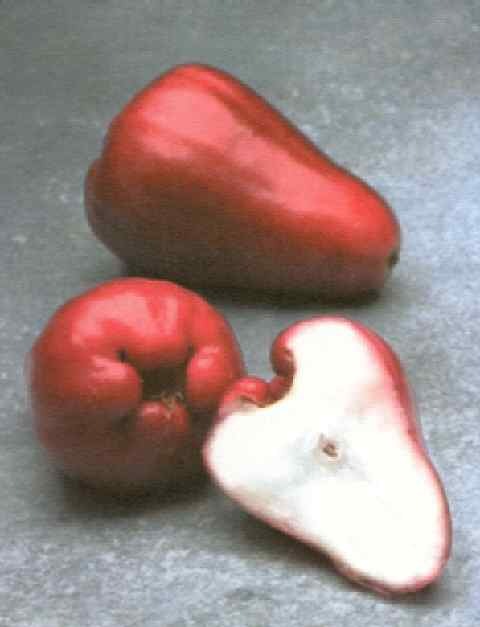 -- S. samarangense (javanica) is the Java rose apple or Semarang rose apple. The fruit is cultivated in its native region of Malaysia and Indonesia and sometimes in tropical America. The fruit is nearly round or bell-shaped, measuring about two inches and lacking in flavour. It is commonly pale green or whitish, but sometimes pink. Other names include: chom-phu khao (Thai), jambu merah or jambu hijau (Malay), jambu semarang (Indonesian), makpoa (Philippines). -- S. aqueum is the watery rose apple or water apple. It originated in the south of India. It still grows wild in India and parts of Malaysia. The fruit has an uneven shape, being wider at the apex than the base. Colour varies from white to bright pink. The flesh is fragrant, crisp and watery making a good thirst quencher. Although they have a high water content, their skins are full of fruit sugars and vitamin A and make a good addition to salads. Other names include: jambu air (Malay/Indonesian), tambis (Philippines).